Kuk Sool Won™, which can be translated as Korean National Martial Arts Association, is a systematic study of all the traditional fighting arts which together comprise the martial arts history of the Korean nation. As such, Kuk Sool Won™ is an extremely well-organized system of martial arts which seeks to integrate and explore all aspects of the traditional Korean martial arts. 1) Closed and open-hand striking methods: including palm, fist, wrist, finger striking techniques and specialized hand training techniques, 2) Pressure point striking, 3) Striking using arm and shoulder, 4) Blocking and parrying. 1) Foundational kicks, 2) Spinning kicks, 3) Jumping kicks, 4) Combination kicks, 5) Double leg kicks, 6) Pressure point kicking, 7) Specialty kicking. 1) Body throws, 2) Projection throws, 3) Leg throws, 4) Pressure point grappling, 5) Grappling defense, 6) Wrestling techniques, 7) Ground fighting. 1) Restraining methods, 2) Joint breaking techniques, 3) Combination joint locking, 4) Control and redirection techniques, 5) Arresting and "come along" techniques. 1) Body conditioning and agility techniques, 2) Body protection techniques, 3) Acrobatics for defense and offense. 1) Overall stretching and flexibility training, 2) Cardiovascular conditioning, 3) Muscle training, 4) Ligament and tendon strengthening, 5) Joint flexibility and conditioning. Techniques based on the movements and/or characteristics of certain "martial" animals such as Tiger, Preying Mantis, Crane, Dragon, Snake, etc. 1) Sword: short, middle and long, single or double, straight or inverted, 2) Staff: short, middle and long, single or double, 3) Jool bong, 4) Spear, 5) Cane, 6) Rope, 7) Fan. ***Note: There are 24 different traditional Korean Royal Court weapons in the curriculum of Kuk Sool Won™, plus Buddhist and family weaponry. 1) Acupressure, 2) Acupuncture, 3) Internal energy systems, 4) Herbal medicine. 1) Various breath control techniques, 2) Meditation and breathing postures, 3) Concentration techniques. 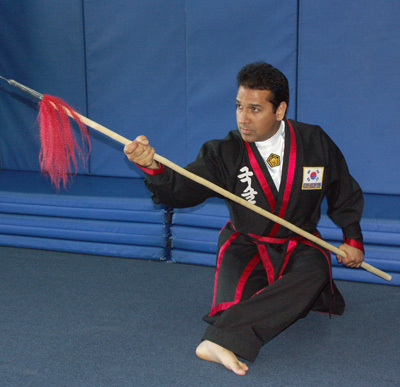 As you can see, Kuk Sool Won™ covers an extensive variety of techniques and martial arts methods, but it is not merely concerned with the physical methods of attack and defense. Kuk Sool Won™ includes the study of healing techniques, the development of internal power, and physical conditioning. Training in Kuk Sool Won™ also helps to instill self-confidence and self-discipline, a calm self-assurance, and the psychological and spiritual values which are traditionally associated with the martial character. Mental and physical well-being is of primary importance in Kuk Sool Won. Although Kuk Sool Won™ as it is practiced today is relatively new, its roots stretch far and deep to the very beginnings of the history of the Korean people. As students of Kuk Sool Won™, this early history and the ancient traditions upon which our art is founded should be as important to us as the physical techniques themselves, for it is only from our understanding and appreciation of these classical roots that we are able to grow as students and as martial artists.